As a writer, there are several tools I have at my disposal to create good content–my computer, my AP Style Guide, and my Roget’s Thesaurus. When I recently came across a software solution aimed at helping writers create more eloquent copy, I thought I’d take a second look. Especially after learning how it can help kids with disabilities too. WordQ acts as a virtual editor by reading what you write aloud and offering suggestions for alternate words that may sound out of place. While writing this post, I typed, “As I was resting the software, I found that…” and while a spell-check would never catch “rested” as an error, WordQ read it back to me, which obviously reinforced that I had made an error and should have instead used “tested.” How awesome is that? The software is very easy to install and becomes nearly invisible upon download. You can use the program as lightly or heavily as you want; have it read back every word you write, or just customize it to just read selected sentences or paragraphs. If you’re an avid proofreader and double and triple-check your work, this probably won’t come in very handy because it simply reinforces things audibly that you would catch anyway. But what’s cool about this technology, which I realized upon further research, is the impact it is having on kids with autism and other learning disabilities. I was touched to read a recent story about an autistic teenager in Canada who is non-verbal, but communicates regularly through assistive technologies such as an iPad and the WordQ software. 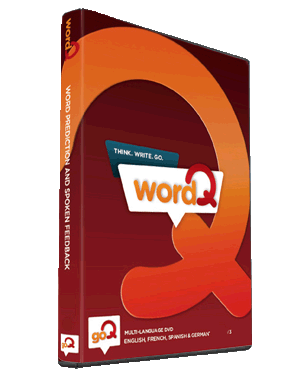 Word Q is priced at $199, but you can test out the software with a free 30-day trial. It works on PC and Mac.